Julitta was a noble lady of Icona, who was Catholic. She also had a son named Cyricus. In order to escape persecution by Emperor Diocletian, she took her son and found refuge at Tarsus. She eventually was recognized as being Catholic, and was report to authorities. She was brought back to Rome, and was presented before the tribunal of Alexander. Because her two servants took flight, she had to bring her small son Cyricus with her. Enraged, Alexander raised the child and hurled him down, dashing his head on the steps of the tribunal. 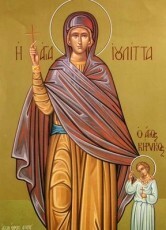 Julitta, filled with joy, gave thanks to God that her son had gone before her into the heavenly realm. She herself was then flayed, plunged in boiling pitch, and at last beheaded. To prevent them from being buried by the Catholics, the prefect ordered their bodies to be cut in pieces and scattered in different places. But an Angel collected the members and the Catholics under the cover of the night buried them. Later, when peace was restored to the Church, an aged serving woman made known the resting place of the two bodies. Devotion to the mother-son martyrs grew, especially in France, after Bishop Saint Amator of Auxerre brought some relics to the monastery of Saint-Armand in the Tournai in the 4th century. Many churches in Europe are named after these saints today, and devotion is popular. Many catholics in France and Italy have strong devotions to these two saints as of today. Their heroic death signals to us believers today, the importance of knowing our faith, and “defending” that faith – never denouncing it for the world. How many of us are willing to be martyrs by staying steadfast to our faith? The heroic virtues that our forefathers have set for us in examples of their lives, is something we can all draw courage from. If you need protection for your children – don’t forget to call upon St. Julitta; she is always a prayer away, and a proven track record of helping children.